New York City: This mega-metropolis is world-renowned for its nightlife, shopping, and culture. 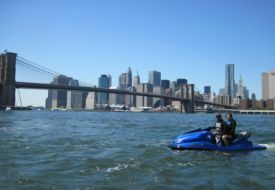 But the Big Apple also offers plenty of opportunities for big adventure of the adrenaline kind, too. Here, a few suggestions on how to explore the city by climbing, running, and even jet skiiing. Bouldering in Central Park: Sure, this 843-acre park is the outdoor playground for the city's active types, and learning how to run, cycle or rollerblade among the constant crowds and cars takes some getting used to. But if you're up for changing up your routine the next time you're in this great park, consider bouldering. Two of the most popular spots, Rat Rock and Cat Rock (both named for the animals that once congregated there), are located in the southwest corner of the park, near the busy 59th Street Columbus Circle subway station. The approximately 12-14 foot Rat Rock is the more beginner-friendly of the two, but no matter what your skill level, the spot is a "great way to meet people," says Brooklyn resident Thomas Turnbull, a local climber who also runs the website ClimbNYC.com, a great resouce for climbing in the city. "On sunny days, there are usually at least half a dozen people there." If you're a more serious climber, another option is the Gunks (one of our Top 10 Fall Foliage Adventures), the best climbing in the area, just a 90 minute drive from the city. Another, if slightly less popular, climbing area is in the north end of the park, with several boulders on the west side, around 100th Street. Make a Run For It: NYC's official track club, the New York Road Runners, is well known among running circles as the gold standard for putting on efficient, excellent races. Their hugely popular marathon (this year, it takes place on Nov. 7) has a waiting list and a lottery every year, but with about 50 races (and tons of other events) annually, you still have plenty of chances to hit the road while mingling with local runners. Frequent visitor to the Big Apple? Consider joining New York Road Runners as a member: Your $40 fee pays for itself in just a couple of races with your member discount, and if you've always wanted to get into the marathon, you're guaranteed eligibility. Now, off to the races! A Real Jet Setter: Imagine gazing up at the Statue of Liberty, one of the city's (and country's) most iconic landmarks ... from a jet ski? Thanks to a unique group of urban adventurers and jet ski fantatics called the Jetty Jumpers, that's now possible. Run by native New Yorker Anthony Stallone, who lives in Coney Island, the tours last at least three hours and provide incredible views from the water of such landmarks as the Brooklyn Bridge, Lady Liberty, Coney Island and the famed Manhattan skyline (photo courtesy of the Jetty Jumpers). Tours start at $325 per person ($475 for a couple), but include photography and videos, as well as a truly unique, and adventurous, way to see the city. Says Stallone: "It's a total day of dedication [to the client]. When I pull up underneath the Brooklyn Bridge, people are like, 'Holy cow!'". With the weather turning cold, Stallone says tours will probably continue through mid-November and resume in May. For more information, visit www.jettyjumpers.com.